Comedian, and star of US Sitcom, “Curb Your Enthusiasm”; Larry David, is in many respects, representative of many males of a certain age. Often characterised by high levels of scepticism, with a, “What’s in it for me?”-style attitude, he’s somebody I can closely relate to! As we say around my neck of the woods, he’s a “miserable blighter” at the best of times, but hilarious with it. 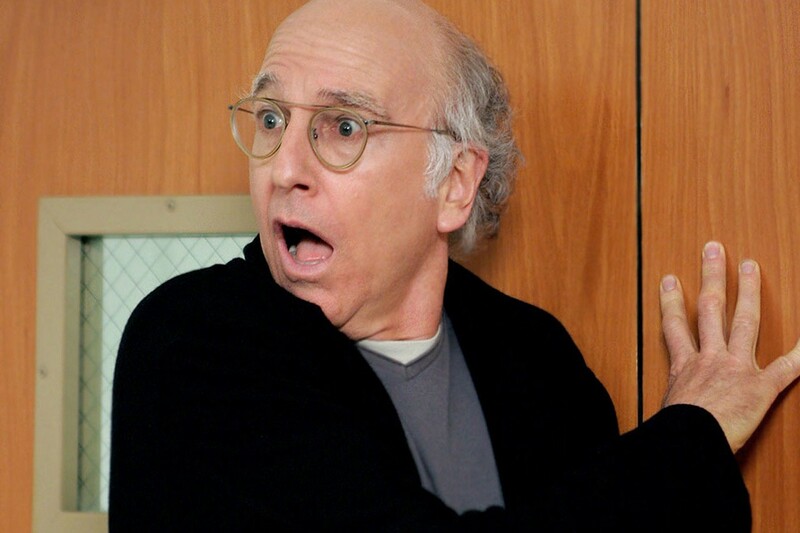 In this light-hearted post, I look at some of Curb’s best “Larry David-isms” and how these relate to UX. This is quite possibly one of my favourite moments in Curb history because it’s something that I can personally relate to. It doesn’t matter which coffee shop you walk into, each chain has it’s own pretentious naming convention for differentiating between its various drink sizes. Take Costa’s “Primo”, “Medio” and “Assimo” drink sizes, for example — these words bear no resemblance in spelling to their English translations — “Small”, “Medium” and “Large”. This, in turn, can make it extremely difficult for the average, “once-in-a-blue-moon”, coffee-purchasing customer to fathom out what size they need to order. Then there’s Starbucks’ “Tall”, “Grande” and “Venti”. Of the three, common-sense suggests that “Grande” should be the biggest size, given its similarity in spelling and pronunciation to the word, “Grand”. Not the case. It’s actually, “Venti”, which translates from Italian to English as the number “20” — or 20 US fluid ounces in Starbucks’ case. The mind boggles! These same rules apply to navigational signposting, call-to-action labelling, and general copy across your websites and apps. Think very carefully about your choice of wording so as not to risk confusing your user. Air con rage is always rife in the office. It’s a sure fire way to cause a ruckus among colleagues. Just like Larry, we inevitably have to come to a compromise to keep the peace — and to stop the moaners, whining about being cold! It’s the same with UX. There will always be some level of compromise, especially when it comes to addressing the needs of both the user and the business’ stakeholders. Delivering a solution that satisfies, if not exceeds, the expectations of both parties, can be somewhat of a near-impossible mission. As UX professionals, compromise may be a result of factors beyond our control, but which impact the experience we’re ultimately able to deliver — business requirements, opinions of others, time, resource, budget, technical constraints, project dependencies and risk, for example. A passion and desire for what you stand for and believe in, can easily be misconstrued, especially during intense meetings, so think before you act. Easier said than done in the heat of the moment — unless the air con’s on, of course! In this scenario, Larry steps into a lift, just as the door is about to shut. As he enters, there is a smartly-dressed Businessman waiting to go up to the 44th floor. Larry first presses the button for the 31st floor, moments later, deciding he actually wants the 32nd floor, causing somewhat of an inconvenience to his fellow occupant. All too often, we see similar instances of this in UX, where users’ precious time is wasted as a result of being asked to do more work than is strictly necessary. Difficult navigation, complex forms, unscannable content, forced registration to make a purchase — the list goes on. Even if only a second or two, it’s incredibly frustrating. In worse-case scenarios, it can even result in users exiting your website/app, altogether. So what can we, as UX professionals, do to address this? Well, for a start, we can use our common-sense. If there’s even an inkling of doubt that something feels complicated, complex or convoluted to us as subject matter experts, it’s more than likely going to cause problems for our users, and in turn, delay their ability to complete the task they set out to achieve. Every second counts. Second-guessing the actions and behaviours of our users is not worth the risk. Instead, my recommendation would be to carry out user testing, with REAL users; individuals who are representative of our personas (or is it, personae?). This, in turn, will give us actionable feedback, with a view to test, learn and refine, until we’ve arrived at a solution that sufficiently satisfies our users, if not, exceeds their expectations. As far as performance testing is concerned, there are a whole host of third-party tools and solutions available to help with this. With the increased usage of websites and apps, on the go, it’s imperative to carry out thorough speed tests across all types of mobile device connection speeds — G, E, 2G, 3G, H and 4G — to simulate real-life behaviour. Remember, your website or app may be used anywhere — not just over the super-fast Wi-Fi, you have access to at home or in the office. Optimise your customer journeys by removing any barriers that may slow or completely halt your users in their tracks. Delays, no matter how small, will prove costly. We all like a free sample or two — that’s half the reason I end up at Costco, most weekends! Free food and free booze — what more can a guy ask for?! That said, there are some greedy buggers, who take the biscuit (quite literally!) — “sample abusers”, in Larry’s case. The phrase, “The customer is always right”, is something that we’re forever being reminded of, to convince us to give customers a good service. That said, just like Larry experienced at the ice cream parlour, there are times when you have to deal with the most difficult customers. On those occasions, you may take a slightly different stance (one more like Larry’s), on the phrase originally coined in 1909, by Founder of Selfridge’s first department store, Harry Gordon Selfridge. For us UX professionals, “customers” may be the actual users of the experience we are designing for, as well as our internal stakeholders. The latter can often be much more difficult to please! All to often, you’ll have worked your socks off conducting user research and competitor analysis, producing wireframes and high-fidelity designs, with various types of user testing carried out in between, which in turn, has led to the development of a prototype you’re proud of and strongly believe will go a long way to solving the problem you set out to achieve. You’ll then come to present your Proof of Concept (PoC) to a set of internal stakeholders, only for the HiPPO (Highest Paid Person’s Opinion) to shoot it down, overruling your hard work and efforts with their ego-fuelled, crazy, delusional ideas — the kinda stuff, nightmares are made of! Then there’s the excitement (and the shock factor) that comes with external user testing — be it in the form of moderated face-to-face testing, remote user testing, guerrilla testing, or similar. For every four individuals you carry out testing with, who provide fantastic, actionable insight and feedback, you’re guaranteed to get that one doofus who’s just come along for the ride (and the money!) — the kind that come out with comments like, “Why don’t you shoot photos of sexier-looking models wearing your range?”, for example. Suffice to say, the customer is not always right. Just because they have a requirement, doesn’t necessarily mean, we have to adhere to it — backing up your argument against delivering a requirement, with research-driven stats, is usually a good idea though. You have to weigh up the potential Return on Investment (ROI) from actioning that request, against the resulting impact it will have on all customers. As discussed earlier in this post, balancing the needs of both our internal stakeholders and external users can be an extremely difficult task, so we’re inevitably going to have find a compromise. We may, in turn, end up making mistakes that lead to a much worse-off experience for everybody. In short, we don’t always get it right, either. Originally written and published to www.uxchap.com on April 21st 2016, by Joe Pendlebury.